When someone says “chocolate bar,” most of us think of the thing you buy from Hershey. But if you’re the kind of person who always has beer on your mind, you may conjure up an alternate meaning: a bar, the kind you drink at, made entirely out of chocolate. 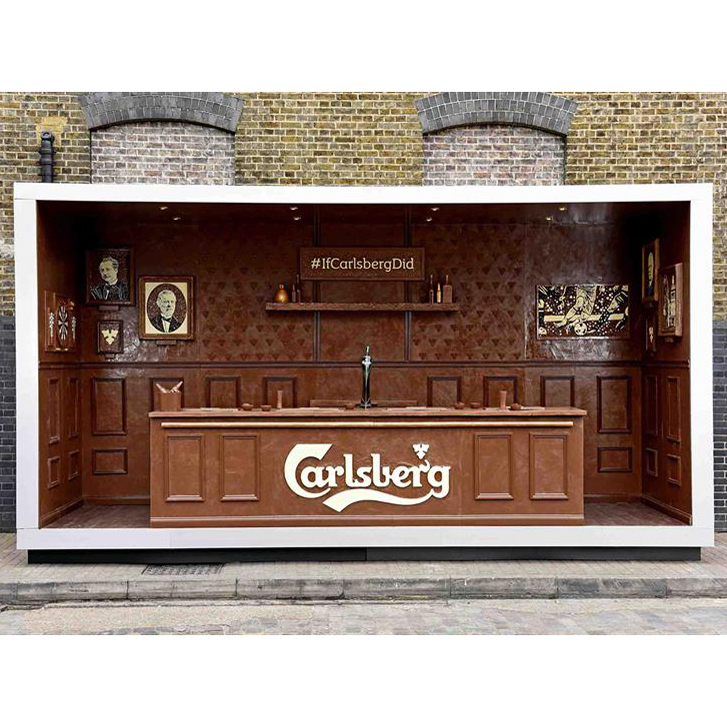 The people at Carlsberg obviously spend a lot of time thinking about beer – it’s their business – so in a promotion timed to coincide with this past weekend’s always-chocolate-saturated Easter holiday, the beer brand unveiled a pop-up bar literally made from everyone’s favorite dessert flavor. This past Wednesday, from noon to 5pm, people hanging out outside the Old Truman Brewery in London's Shoreditch neighborhood could drop into the 16 foot by 10 foot by 6 foot mini-pub to enjoy a pint of Carlsberg, and then if they get hungry, literally eat the bar, the glasses, the dartboard… Pretty much everything in the entire place was made from a half ton of chocolate. According to Ad Week, the project took three months to execute. Eating it all would probably take even longer. The whole idea is about as fun as a corporate advertising campaign built around a silly pun can be. That said, I’m not really sure how well chocolate and beer go together. If I created a chocolate bar, I’d maybe still to serving something like mudslides – though you might face a few lawsuits over the ensuing sugar comas. What to do with half a tonne of chocolate and some ice cold Carlsberg? Introducing #IfCarlsbergDid chocolate bars… Click the link in the bio to watch the whole thing.